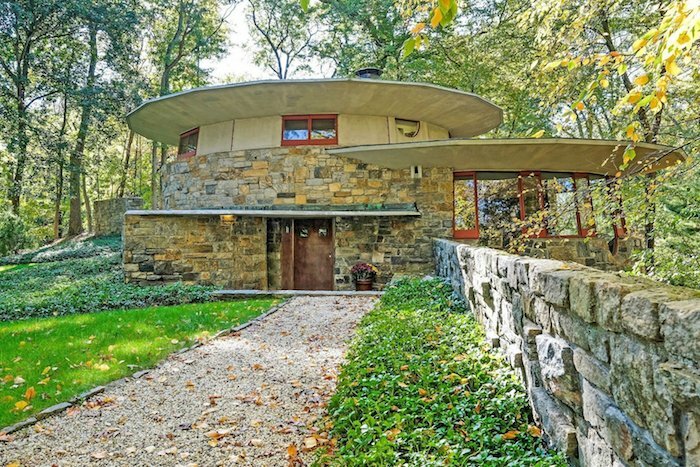 Built in 1948 and named ‘Toyhill‘ by Wright himself, this home is considered an artistic masterpiece and shows Wright’s early interest in overlapping circular masonry, which would become an innovative and iconic treatment found in his later work—including the Guggenheim Museum. 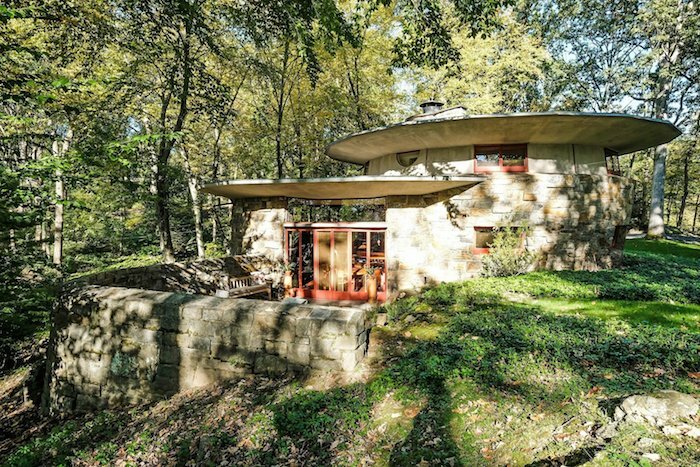 Located an hour outside of Manhattan in Pleasantville, New York, the Sol Friedman house (also called Toyhill) is one of a handful of homes that Wright personally designed as part of his Usonian homes project, which was intended to offer beautifully designed, affordable homes to middle-income buyers. 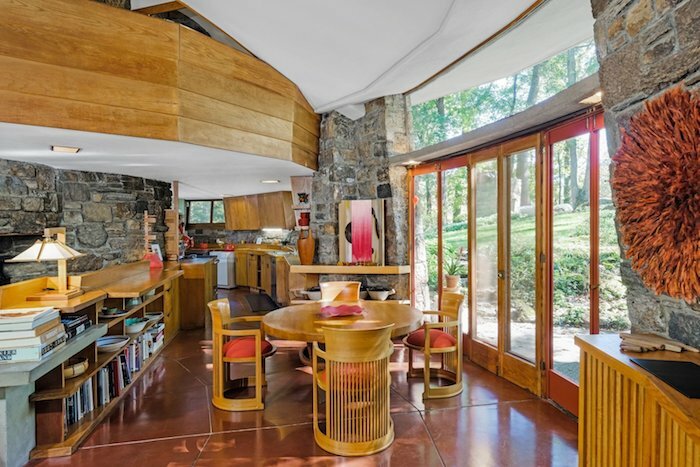 The 2,164-square-foot midcentury home offers three bedrooms, two bathrooms, and an open layout that connects the living areas with a continuous, circular flow. 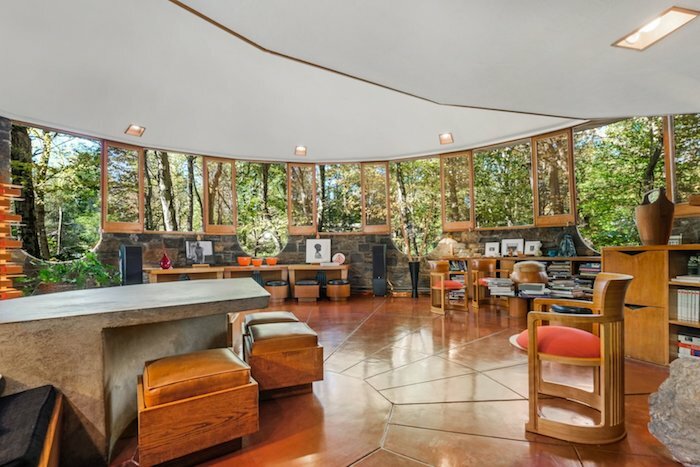 The round, light-filled design is intended to create a visual connection between the interior space and the serene exterior environment. 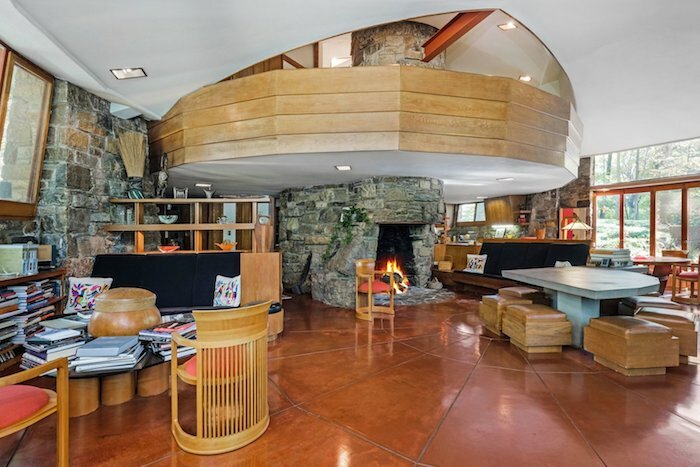 The home also features a large center fireplace, oak built-ins, and Wright-designed furniture. 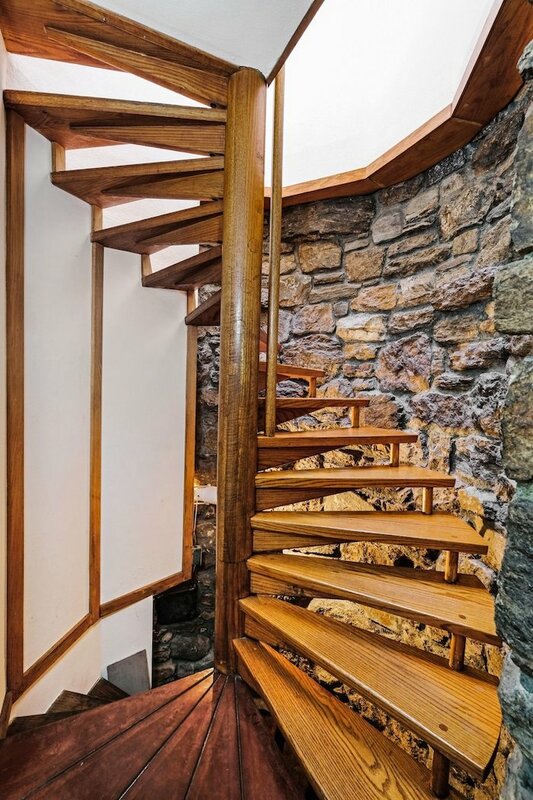 A winding staircase connects the main living areas with the bedrooms on the upper level. The upstairs bedrooms feature clerestory windows, which were specially designed to allow optimal light and airflow into the higher stories while still maintaining privacy. 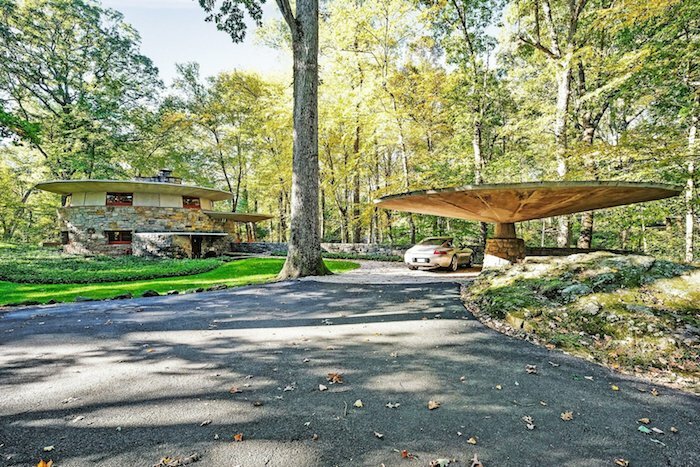 A unique feature of this Usonian home is the roof’s upturned and cantilevered overhang (pictured above), which allows for passive solar heating and natural cooling without obstructing surrounding views. 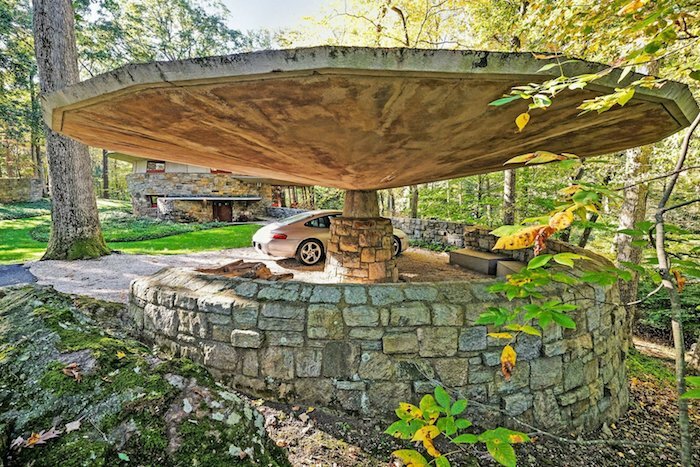 Adjacent to the house is a distinctive mushroom-like concrete-pedestal carport, which naturally echoes the circular construction of the main house. 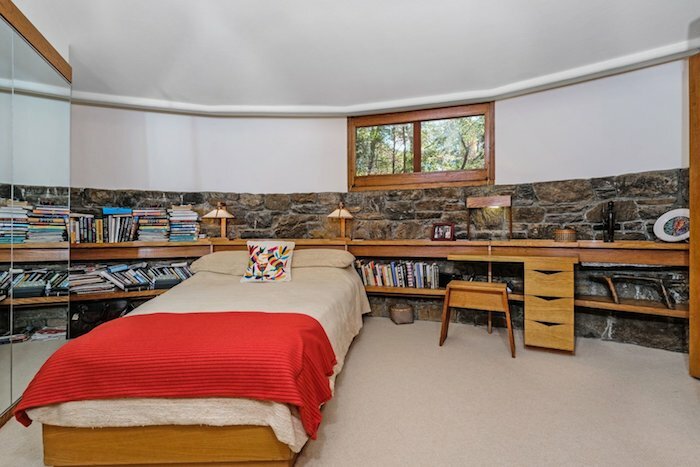 The home is currently listed through Houlihan Lawrence for $1.5 million.